St. Mary's Church (Polish: Bazylika Mariacka, German: St. Marienkirche), or formally the Basilica of the Assumption of the Blessed Virgin Mary (Polish: Bazylika Mariacka Wniebowzięcia Najświętszej Maryi Panny w Gdańsku), is a Roman Catholic church in Gdańsk, Poland. Its construction began in 1379, or 1343 according to the official website. With its volume between 185,000 m3 and 190,000 m3 is currently one of the two or three largest brick churches in the world, and one of the two or three largest north of the Alps. Only San Petronio Basilica in Bologna, comprising 258,000 m3 is larger, Munich Frauenkirche and Ulm Minster also comprise 185,000 to 190,000 m3. Between 1536 and 1572 St. Mary's Church was used for Roman Catholic and Lutheran services simultaneously. From the 16th century until 1945, when Danzig became Polish Gdańsk, it was the second largest Lutheran church in the world. It is 105.5 metres (346 ft) long, and the nave is 66 metres (217 ft) wide. Inside the church is room for 25,000 people. It is an aisled hall church with a transept. It is a co-cathedral in the Roman Catholic Archdiocese of Gdańsk, along with the Oliwa Cathedral. According to tradition, as early as 1243 a wooden Church of the Assumption existed at this site, built by Prince Swantopolk II. The foundation stone for the new brick church was placed on 25 March 1343, the feast of the Annunciation. At first a six-span bay basilica with a low turret was built, erected from 1343 to 1360. Parts of the pillars and lower levels of the turret have been preserved from this building. In 1379 the Danzig architect Heinrich Ungeradin and his team began construction of the present church. Their building shows some differences from St. Mary's Church in Lübeck, sometimes called the mother of all Brick Gothic churches dedicated to St. Mary in Hanseatic cities around the Baltic, and it has some details in common with Gothic brick churches in Flanders and the Netherlands. By 1447 the eastern part of the church was finished, and the tower was raised by two floors in the years 1452–1466. From 1485 the work was continued by Hans Brandt, who supervised the erection of the main nave core. After 1496, the structure was finally finished under Heinrich Haetzl, who supervised the construction of the vaulting. In the course of the Reformation most Danzigers adopted Lutheranism, among them the parishioners of St. Mary's. After a short wave of turbulent religious altercations in 1525 and 1526, in which the previous city council was overthrown, the new authorities favored a smooth transition to Lutheran religious practice. In 1529 the first Lutheran sermon was given in St. Mary's. From 1536 — in cooperation with Włocławek's Catholic officials — a Lutheran cleric was permanently employed at St. Mary's and both Lutheran services and Catholic masses were held. The Lutheran congregation then began registering personal data, and the oldest surviving register is that of burials starting in 1537. In July 1557, King Sigismund II Augustus of Poland granted Danzig the religious privilege of celebrating communion with both bread and wine. Thereafter the City Council ended Catholic masses in all Danzig churches except St. Mary's, where Catholic masses continued until 1572. As part of the smooth transition Lutheran pastors and services at first also continued Catholic traditions, including using precious liturgical garments, such as chasubles. However Catholic traditions gradually were abandoned at St. Mary's. Danzig's Lutheran congregation, like others in northern Europe, stored the old liturgical garments, some of which survived. The inventories of St. Mary's reflect usage of Catholic-style accessories in Danzig's early Lutheran services. The inventory of 1552 still mentions a great stock of garments and embroideries. The parishioners of St. Mary's formed a Lutheran congregation which - as part of Lutheran church polity - adopted a church order. A more elaborate church order (constitution) followed in 1612, the Alte kirchenordnung. The first senior pastor (Erster Pfarrer, pastor primarius) of Danzig's Lutheran state church was Johannes Kittelius, pastor at St. Mary's between 1566 and 1590. The church officially was called Supreme Parish Church of St. Mary's (Oberpfarrkirche St. Marien), indicating its prominent position in the city. Due to the anti-Bathory rebellion, in 1577 the Polish King Stephen Báthory imposed the Siege of Danzig (1577). The defense of its political position forced the city to hire mercenaries, who were so costly that the City Council confiscated gold and silver from the inhabitants and from the treasuries of the city and its Lutheran state church. Most of the gold and silver utensils of St. Mary's were melted down and minted to pay the mercenaries. An inventory of 1552 still recorded no less than 78 silver gilt chalices, 43 altar crucifixes, 24 great silver figures of saints and the like more. After 1577 most of it was gone. The Danzig rebellion ended in December 1577 with a compromise forcing the city to pay the king the sum of 200,000 Polish guilders. But the Polish monarch also recognised Danzig's religious freedom and Lutheran faith. As a compromise the jurisdiction over Danzig's Lutherans as to marital and sexual matters remained with Włocławek's Catholic officials. In 1594, the Polish royal court tribunal attempted to restore Catholic services to St. Mary's, but the City Council rejected that approach. But as a compromise, since the Catholic kings of Poland had been the nominal heads of the City since the Second Peace of Thorn (1466), the Council authorised building the baroque Catholic Royal Chapel. It was erected by Tylman van Gameren (Gamerski) and completed in 1681, near St. Mary's Church, for the king's Catholic service when he visited Danzig. With St. Mary's pastor Constantin Schütz (1646–1712) a moderate pietist theology replaced the previously dominant Lutheran orthodoxy. St. Mary's Church around 1900 seen from the then- Jopengasse (now Piwna Street). St. Mary's Church around 1900 seen from the then- Frauengasse (now Mariacka Street). 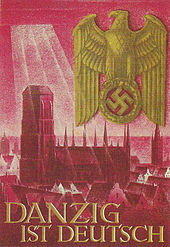 25 Danzig Gulden note of 1931 depicting St. Mary's Church, then the Protestant Marienkirche. In the course of the Partitions of Poland the city lost its autonomy in 1793, regaining it for a short period (1807–1814) as a Napoleonic client state, before it became part of the Kingdom of Prussia in 1815. The Prussian government integrated St. Mary's and all the Lutheran state church into the all-Prussian Lutheran church administration. In 1816 the Danzig Consistory was established taking on the tasks and some of the members of the Danzig spiritual ministerium. Danzig's then senior, and prime pastor at St. Mary's (1801–1827), Karl Friedrich Theodor Bertling, became a consistorial councillor in the church body. In 1817 the government imposed the union of Reformed and Lutheran congregations within the entire kingdom. First intended to win all these congregations to adopt a unified Protestant confession, the vast Lutheran majority insisted on retaining the Augsburg Confession, thus St. Mary's remained a Lutheran church and congregation, but joined the new umbrella of the Evangelical Church in Prussia in 1821, a regional Protestant church body of united administration but no common confession, comprising mostly Lutheran, but also some Reformed and united Protestant congregations. In 1820, during Bertling's pastorate, long forgotten chests and cabinets in the sacristy were opened and the first medieval garments and liturgical decorations were rediscovered. In the 1830s more historic garments were found. At that time the congregation did not grasp the richness and rarity of these findings. So when Chaplain Franz Johann Joseph Bock, art historian and curator of the then Cologne Archdiocesan Museum, reviewed the discoveries he acquired a number of the best pieces from the congregation. Bock showed them in an exhibition in 1853. After his death some Danzig pieces from his personal collection were sold to London's Victoria and Albert Museum. These and also later sales to private collectors included cloths and vestments made of fabrics from ancient Mesopotamia and ancient Egypt, obtained during the Crusades; as well as renaissance wares from Venice, Florence and Lucca (more than 1000 items altogether). In 1861–64 a Sexton named Hinz systematically searched chests, cabinets and other storages in chambers and rooms, also in the tower, and found many more historic liturgical garments. In the 1870s and 1880s the congregation sold more than 200 incomplete pieces, but also intact altar cloths and embroideries to the Berlin Museum of Decorative Arts. The remaining pieces of the garment collection, the so-called Danziger Paramentenschatz (Danzig Parament Treasure), mostly originate from the 150 years between 1350 and 1500. The congregation also sold other artifacts, such as the winged triptych by Jan van Wavere, acquired by Archduke Maximilian, now held in the Church of the Teutonic Order in Vienna, and the sculpture of the Madonna and Child by Michael of Augsburg from the main altar, sold to Count Alfons Sierakowski, now in the chapel in Waplewo Wielkie. In addition, the Prussian authorities melted down gold and silver reliquaries for reuse. Until World War II, the church interior and exterior were well preserved. Between 1920 and 1940 St. Mary's became the principal church within the Protestant Regional Synodal Federation of the Free City of Danzig. In this time the presbytery (board of the congregation) discerned the value of its parament collection and prompted its cataloguing. During a renovation in the 1920s more historic garments and altar cloths were found. From 1930 to 1933 Walter Mannowsky, then director of the City Museum (now housed in the National Museum, Gdańsk), delivered a detailed four volume inventory of the Paramentenschatz. It was then presented in the St. Barbara Chapel of St. Mary's. In 1936 the Paramentenschatz was moved to a newly equipped room in the City Museum with a controlled climate, since the Barbara Chapel was too damp. The Paramentenschatz remained property of the congregation, presented on loan in the city museum (Stadtmuseum). St. Mary's on a German Nazi propaganda poster; the inscription reads: "Danzig is German" (summer 1939). Beginning in the third war year 1942, major items of Danzig's cultural heritage were dismantled and demounted in coordination with the cultural heritage curator (Konservator). The presbytery of St. Mary's Church agreed to remove items like archive files and artworks such as altars, paintings, epitaphs, mobile furnishings to places outside the city. Meanwhile, churches in Danzig as elsewhere in Germany, and in German-occupied areas, saw their church bells requisitioned as non-ferrous metal for war production. Bells were classified according to historical and/or artistical value and those categorised the least valuable and cast after 1860, and especially those requisitioned in occupied areas, were melted down the first. The church was severely damaged late in World War II, during the storming of Danzig city by the Red Army in March 1945. The wooden roof burned completely and most of the ceiling fell in. Fourteen of the large vaults collapsed. The windows were destroyed. In places the heat was so intense that some of the bricks melted, especially in the upper parts of the tower, which acted as a giant chimney. All remaining bells crashed down when their bell cages collapsed in the fire. The floor of the church, containing priceless gravestone slabs, was torn apart, allegedly by Soviet soldiers attempting to loot the corpses buried underneath. By the end of the Second World War many German parishioners of St. Mary's fled westwards, and also the parament treasure was evacuated to the west. In March 1945 Poland began expelling the remaining ethnic Germans in the city even before the border changes promulgated at the Potsdam Conference assigned the city to Poland. Most of St. Mary's surviving parishioners wound up in the British occupation zone in northern Germany. Lübeck became a center for exiled Germans. All property of St. Mary's Lutheran congregation in Danzig (now Gdańsk) was expropriated and its cemetery despoiled. However, two unsmelted bells of St. Mary's, dating from 1632 and 1719, later were found in the so-called Hamburg bell cemetery (Glockenfriedhof). Of the prewar chimes, there still exist two bells, after restitution to the congregation loaned by its presbytery exiled in Lübeck to other congregations in northern Germany. Osanna from 1632 can be found in St. Andrew's Church, Hildesheim, and Dominicalis from 1719 can be found under the name Osanna in St. Mary's Church, Lübeck, both in Germany. Dominicalis is used by the congregation of Lutheran St. Mary's Church, and the parament treasure is on public display. Danzig/Gdańsk was gradually repopulated by more Poles, and Polish authorities handed over St. Mary's Church to the Catholic diocese. Most of the artworks from the interior survived, having been evacuated for safekeeping to villages near the city. Many of these have returned to the church, but some are displayed in various museums around Poland. The diocese has sought to secure their return. The reconstruction started shortly after the war in 1946. The roof was rebuilt in August 1947, using reinforced concrete. After the basic reconstruction was finished, the church was reconsecrated on November 17, 1955. The reconstruction and renovation of the interior is an ongoing effort. On November 20, 1965, by papal bull, Pope Paul VI elevated the church to the dignity of the basilica. On February 2, the Congregation for Bishops established the Bazylikę Mariacką as the Gdańsk Co-Cathedral in the then still non-metropolitan Roman Catholic Diocese of Gdańsk. Since 1925 the Oliwa Cathedral is the cathedral of the diocese (elevated to archdiocese in 1992). The funeral of Paweł Adamowicz, the assassinated Mayor of Gdańsk, took place at the basilica on 19 January 2019. St. Mary's Church is a triple-aisled hall church with a triple-aisled transept. Both the transept and the main nave are of similar width and height. Certain irregularities in the form of the northern arm of the transept are remnants of the previous church situated on the same site. In all, the building is a good example of late Gothic architecture. The vaulting is a true piece of art. Much of it was restored after WW. II. Main nave, transept and presbytery are covered by net vaults, while the aisles are covered by crystal vaults. The exterior of the nave is dominated by plain brick walls and high and narrow pointed arch windows. Such a construction was possible by placing corbels and buttresses inside of the church and erecting chapels between them. Similar constructions have been used in Albi Cathedral (1287–1487, Southern France) and Munich Frauenkirche (1468–1494). The gables are divided by a set of brick pinnacles. All corners are accentuated by turrets crowned by metal headpieces (reconstructed after 1970). Similar turrets can be found on the town hall of Lübeck as well as on the two large Churches of Leiden and on the Ridderzaal in The Hague. The nave is covered by parallel longitudinal roofs, such as common in Flanders and the Netherlands. The skin of these roofs is formed by more than 8,000 m2 of red ceramic tiles. The vaults of the ceiling have an elevation of nearly 30 meters above the floor. They are supported by 27 pillars. The church covers an area of almost half a hectare and can hold more than 25,000 people. The massive tower, well visible on the city's skyline, has a height of about 80 meters. In the old days it served an important function but today it is just an observation platform. It is stabilized by strong buttresses. The church has seven portals, one in the west under the steeple, one in the eastern façade of the choir, two on the northern and three on the southern side, six of them (all except the western) are of sandstone masonry. At the turn of the 14th and 15th centuries the church was rebuilt and greatly enlarged. The final shape of the church was achieved over 150 years after initial building work had begun. At this time the side aisles and the stellar vaulted ceiling, the most beautiful in Poland, was added. The dimensions of this temple are very impressive – the nave is 105m long and 66m wide. Organ set, partially transferred from St. John's church in 1985. There are two bells in St Mary's Church. Both of them were cast in 1970 by foundry Felczyński in Przemyśl. The larger one is called Gratia Dei, weighs 7,850 kilograms (17,310 lb), and sounds in nominal F sharp. The smaller bell is the so-called Ave Maria, weighs 2,600 kilograms (5,700 lb), and sounds in C sharp. Wikimedia Commons has media related to Church of St. Mary in Gdańsk. ^ a b c d e f g h i j k Heinz Neumayer, „Danzig“, in: Theologische Realenzyklopädie: 36 vols., Berlin and New York: de Gruyter, 1977–2006, vol. 8 (1981): 'Chlodwig – Dionysius Areopagita', pp. 353–357, here p. 355. ISBN 3-11-013898-0. ^ "turystyka,89,684". gdansk.pl. Retrieved 2017-12-14. ^ a b c d e f g h i j k Walter Mannowsky, Der Kirchenschatz von St. Marien in Danzig, Landesverkehrsverband für das Gebiet der Freien Stadt Danzig (ed. ), Danzig: Danziger Verlags-Gesellschaft, 1936, p. 10. ^ This is why these Lutheran churches have garment collections often comprising a broader range and greater number of old garments than Catholic parishes. ^ a b c d Walter Mannowsky, Der Kirchenschatz von St. Marien in Danzig, Landesverkehrsverband für das Gebiet der Freien Stadt Danzig (ed. ), Danzig: Danziger Verlags-Gesellschaft, 1936, p. 3. ^ Heinz Neumayer, „Danzig“, in: Theologische Realenzyklopädie: 36 vols., Berlin and New York: de Gruyter, 1977–2006, vol. 8 (1981): 'Chlodwig – Dionysius Areopagita', pp. 353–357, here p. 354. ISBN 3-11-013898-0. ^ Heinrich Doering, Die deutschen Kanzelredner des achtzehnten und neunzehnten Jahrhunderts: Nach ihrem Leben und Wirken, Neustadt an der Orla: Wagner, 1830, p. 5. ^ a b c d e f g h Walter Mannowsky, Der Kirchenschatz von St. Marien in Danzig, Landesverkehrsverband für das Gebiet der Freien Stadt Danzig (ed. ), Danzig: Danziger Verlags-Gesellschaft, 1936, p. 11. ^ Wtedy to władze pruskie wywiozły z gdańskiego kościoła Marii Panny skarb, na który składały się szaty kościelne z tkanin pochodzących ze starożytnej Mezopotamii i Egiptu (! ), a zdobytych w czasach wypraw krzyżowych, średniowieczne dalmatyki i kapy, renesansowe wyroby mistrzów z Wenecji, Florencji i Lukki, naczynia liturgiczne i relikwiarze, w sumie ponad tysiąc arcydzieł. Większość rozprzedano, wyroby ze złota i srebra przetopiono, część haftów... spruto, a złotej nici użyto na galony oficerskie! Jan Pruszyński. "Kulturkampf". www.wprost.pl (in Polish). Retrieved 2009-11-21. ^ Among the pieces is a Chinese silk cloth with an embroidered blessing for al-Malik al-Nasir Nasir al-Din Muhammad ben Qalawun, an Egyptian sultan. Cf. Walter Mannowsky, Der Kirchenschatz von St. Marien in Danzig, Landesverkehrsverband für das Gebiet der Freien Stadt Danzig (ed. ), Danzig: Danziger Verlags-Gesellschaft, 1936, p. 4. ^ Walter Mannowsky, Der Kirchenschatz von St. Marien in Danzig, Landesverkehrsverband für das Gebiet der Freien Stadt Danzig (ed. ), Danzig: Danziger Verlags-Gesellschaft, 1936, p. 9. ^ Cf. Walter Mannowsky, Der Danziger Paramentenschatz: 4 vols., Berlin: Brandus, 1932–1933. ^ a b Volker Koop, Besetzt: Britische Besatzungspolitik in Deutschland, Berlin: be.bra, 2007, p. 144. ISBN 978-3-89809-076-6. ^ Besides thousands of public monuments from non-ferrous metal altogether 45,000 bells from churches in Germany and 35,000 from churches in annexed or occupied areas were requisitioned. They were brought to various factories. In Hamburg in the storage yard of the Norddeutsche Affinerie, nicknamed the Glockenfriedhof (bell cemetery) the British authorities found 16,000 bells in 1945. The Committee for the Restitution of Bells (and monuments), established in 1947, took the task to identify the bells and restitute them to the congregations which owned them. Until 1950 this task had been concluded. Cf. Volker Koop, Besetzt: Britische Besatzungspolitik in Deutschland, Berlin: be.bra, 2007, p. 144. ISBN 978-3-89809-076-6. ^ Between 1955 and 1993 the parament treasure was shown underneath the western organ loft in Lübeck's St. Mary's. Together with paraments from the collection of Lübeck's St. Mary's it is now displayed in the Paramentenkammer (parament chamber) of St. Anne's Museum for the History of Arts and Culture. ^ "Paweł Adamowicz: thousands attend Gdańsk mayor's funeral". The Guardian. 19 January 2019. Retrieved 19 January 2019. ^ a b "www.poland.travel/en-us/sacred-sites/st-mary-s-church-in-gdansk". poland.travel. Retrieved 2017-12-14. "Saint Mary's Church (Gdansk, 1502)". Structurae. Retrieved 2017-12-14. This page was last edited on 5 April 2019, at 21:02 (UTC).